The Buffalo Erie Niagara Land Improvement Corporation (BENLIC) seeks to confront and alleviate the problems distressed properties cause to communities by supporting municipal and regional revitalization efforts and strategically acquiring, improving, assembling, and selling distressed, vacant, abandoned, and/or tax-delinquent properties. Obtain property through In Rem foreclosure public auctions using what is commonly referred to as a “Superbid” authority. The "Superbid' enables BENLIC to exercise a preferred bid at tax foreclosure auction, ensuring more predictable reuse outcomes for properties. Once BENLIC places a bid on a property the bidding ends. Return formerly derelict and tax delinquent property to the tax rolls through sale to responsible owners. Unlike a public auction fraught with risk, BENLIC can govern the disposition of its property to the most responsible buyer. Assist every community in Erie County with meeting their respective land use and neighborhood planning goals. 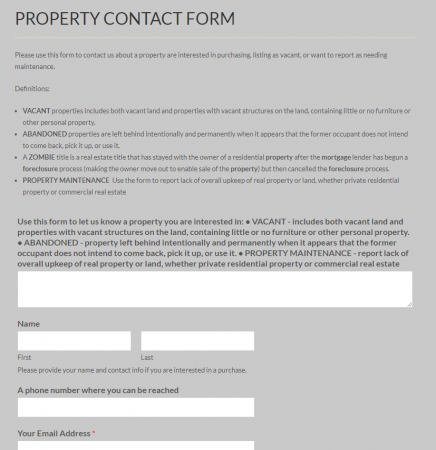 Please use this form to contact us about a property which you are interested in purchasing, listing as vacant, or want to report as needing maintenance. Please contact the Town of Evans Planning Department for more information on available V2V properties.